Derrick Rose walks out of the Moda Center in Portland on crutches after injuring his right knee against the Trail Blazers Friday night. An MRI on Saturday revealed his injury was a torn meniscus. The young Chicago Bulls superstar is down again with right knee injury, a torn medial meniscus in his right knee, to be exact, paired with his past devastating ACL tear in the left. 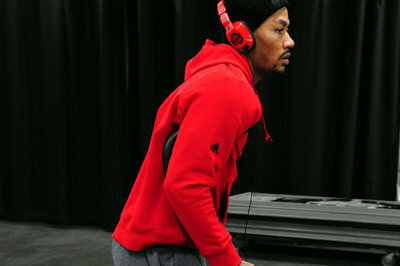 Rose suffered the most recent injury the third quarter of a loss to the Portland Trail Blazers Friday night and today is undergoing his second major knee surgery in under two years as well as his second major recovery period. Reports coming in the past 24 hours are consistently saying that Rose will miss the rest of the season due to his choosing to repair the meniscus in surgery instead of just removing it, which would have likely meant a shorter recovery time. Outside of whether or not the surgery will be successful, the main question now regarding this whole mess is what are the Bulls going to do going forward? One obvious option is to stay the course and keep playing in that ol’ try hard Bulls mentality. ESPN Chicago beat reporter Nick Friedell quoted coach Tom Thibodeau as saying that the Bulls “more than enough to win,” this weekend. And you know what, Thibs is right. They do have enough to win and get stuck at the 5th or 6th seeds in the Eastern Conference. Coach Thibs is the kind of leader that can make a pack of cats believe they can take down a rabid pit bull! But that’s the problem and it doesn’t make the best sense for the future of the Bulls — what does is their second option, the best option. The Bulls have to start over. Go young. It's over for this Bulls' core. They knew it when Rose went down but now the reality is sinking in. Front office has tough decisions ahead. Bulls Vice President of Basketball John Paxson and general manager Gar Forman have to start thinking about the future of their basketball team right now. Nine-year veteran Luol Deng is playing out the last year of his contract and is at risk of making a clean break with the team in free agency. A team on the bubble — who maybe worked themselves there with a unexpectedly good start this season — maybe one with a front office/owner who is willing to make trades impulsively could look hard at acquiring Deng via trade during this regular season. Maybe for that team he could be seen as that one missing piece. In my mind, that team could be the Dallas Mavericks. The Mavs are off to a 9-5 record and you know owner Mark Cuban is always willing to make a move to win, he’ll know soon if not already that his team will have to acquire more talent in order to keep up with the truer heavyweights in the Western Conference. Pay attention Pax and Gar!! After Deng, Carlos Boozer should be next on the transaction carousel. Boozer has been planning very well at the start of this season but he is still a distinct candidate to be released by the Bulls via the reinstated Amnesty Clause. Releasing Boozer would leave one player left from the core of the team that could bring you valuable players and possible high draft picks in return — the beloved Joakim Noah. Noah is a hardworking, rebounding, shot blocking fool on the court and is beloved in many NBA front offices and would be one of the most coveted players on the trading block in recent years if the Bulls put him there. Plus, Kirk Hinrich, Nazr Mohammed and Mike James are all expected to come off the books after this season — they’ll all have to go. It’s time to roll with the younger players for better or worse: Jimmy Butler, Taj Gibson and euro star Nikola Mirotic, who hopefully will join the team next season. It is amazing how one player can affect the entire makeup of a franchise, including its hopes and dreams for a better tomorrow. The Bulls were full of hope and promise this year until until one split-second turn Friday night. Derrick Rose was poised to be the savior of the Bulls franchise and in someways, Chicago as a whole. I hope we haven’t seen the last of Derrick Rose, but we may have already seen the best he had to offer.